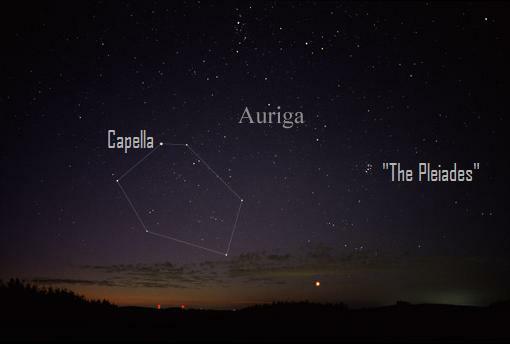 Capella is the brightest star in the constellation Auriga, seen here in the late evening from mid-northern latitudes. Image credit: Wikimedia Commons, annotated by earthsky.org. Like many familiar stars in the night sky, Capella is not exactly what it seems. This twinkling dot is not one, not two, but four individual stars! In 1936, Stearns discovered a faint pair of stars orbiting the bright Capella binary, forming a hierarchical quadruple. While you might expect astronomers to already have a complete understanding of conspicuous stars like Capella—especially the brighter of the two binaries!—observations of this pair of giant stars have historically failed to agree with stellar evolution theories. Today’s paper by Torres et al. revisits the giants of Capella with a new suite of observations to finally address this longstanding mismatch. It takes about 300 years for Capella’s faint binary (circles) to orbit the bright one (+ sign) in this hierarchical quadruple system. The revised orbit (solid line) fits observations better than one from 1975 (dashed line). The dotted line is the line of nodes, where the plane of the orbit crosses the plane of the sky, and the arrow indicates the direction of motion. 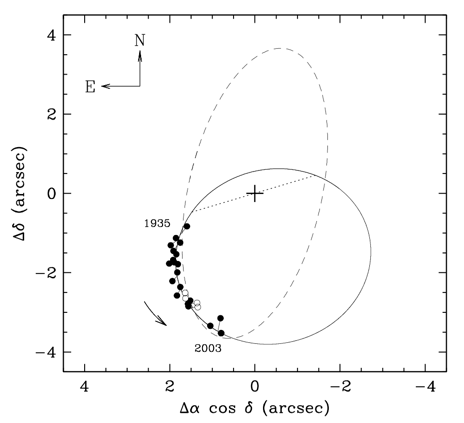 Note that the giant binary discussed here is not resolved in this figure, and both stars are located at the + sign. Figure 12 from the paper. To know a star’s mass is to know its fate. Unfortunately, precise masses for the two giant stars in Capella’s bright binary have eluded astronomers despite a wealth of observations. The problem boils down to the fact that the secondary star is spinning rapidly on its axis, which makes it very tricky to measure how fast it is moving as it orbits. As a result, previous studies haven’t been able to nail down its mass, evolutionary state, or age. A further complication is metallicity. While mass is the main thing that dictates the a star’s life path, chemical composition is a secondary factor, and this is also difficult to measure when a star is spinning rapidly. To confront these problems, Torres et al. use more than 400 new spectroscopic observations over a wide range of wavelengths. The sheer number of observations and the ability to compare brightness at different wavelengths enables them to measure radial velocities and metallicity for the two giant stars much more accurately than before. This means that the bright binary’s nearly-circular 104-day orbit is finally well-constrained, and the authors determine both stars’ masses with impressive 0.3% precision. They are both about 2.5 times as massive as our Sun, but close to 10 times as large. Rapidly rotating stars have smeared spectra. The primary star (top) is rotating at around 4 km/s, and typical absorption lines in this region of spectrum are well-resolved. The slightly less massive secondary star (bottom) is rotating at 35 km/s, causing the lines to Dopper-shift into one another. 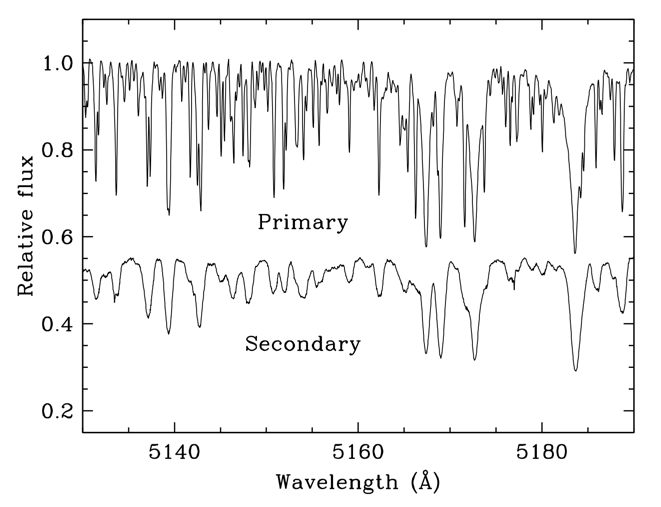 These spectra were carefully disentangled from a set of observations that each contained signals from both stars. Figure 2 from the paper. Now that we know the two giant stars’ masses and chemical compositions, as well as their sizes and other important properties that come from mapping orbits, it’s time to see how these measurements stack up. Torres et al. use a few different techniques to model both giant stars’ past, present, and future, one of which is shown below. The more massive (and thus more evolved) primary star is in the so-called “red clump” phase of life, where it is just beginning to fuse the helium in its core. The less massive secondary star has not yet ignited the helium in its core and is powered instead by a shell of fusing hydrogen. Both stars formed about 650 million years ago. Theoretical evolutionary tracks on an H-R diagram for the two giant stars in Capella. The two dots are the derived luminosities and temperatures based on observations, and the gray box represents the uncertainty. 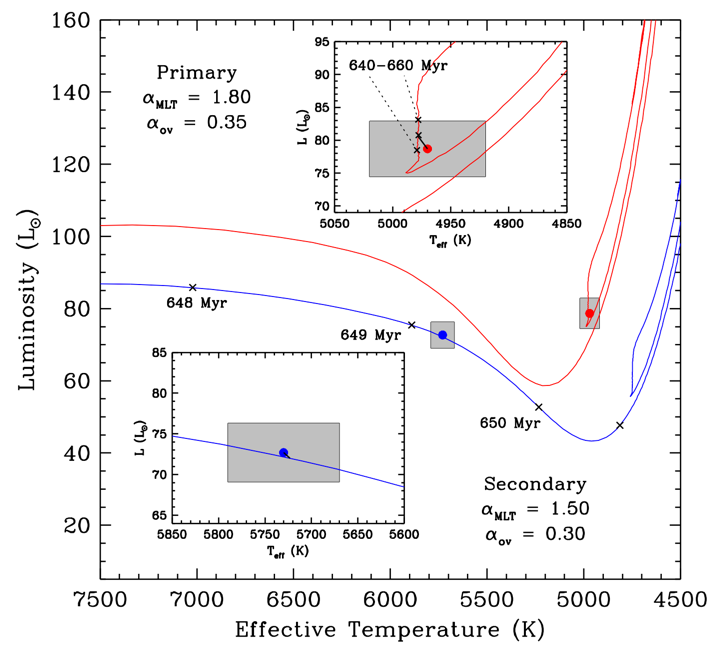 The less massive secondary star (blue) is in a phase of stellar evolution where temperature increases relatively rapidly, which constrains the system’s age. Figure 5 from the paper. In an era when we are discovering and characterizing distant exoplanets by the dozen, it’s humbling to remember there are still some cosmic mysteries visible to the naked eye.